Before anyone can drive on West Virginia roads and highways, vehicles must be titled and registered beforehand. The license plate, registration card, and insurance certificate should be kept in the vehicle at all times. If you live in West Virginia and want to drive a vehicle on public roads, you must register it. When a vehicle is registered in West Virginia, the owner will receive a license plate and registration card, which should be kept in the vehicle with the current insurance certificate at all times. New Residents must have their vehicles titled and registered within thirty (30) days of establishing residency. If your license plate is lost or stolen, you can apply through DMV Online Services for a replacement plate. Once a plate is reported as lost or stolen, the same plate number cannot be used again. Immediately notify the West Virginia State Police if a license plate is lost or stolen. 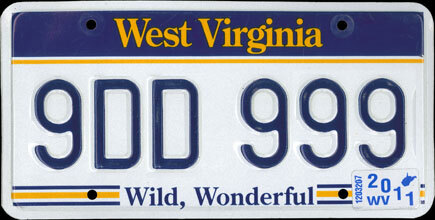 There are a number of special license plates being offered in West Virginia. A vehicle must already be titled and registered with a regular license plate before applying for any of the special license plates. Click here to view the license plate collection posters. Personalized plates are issued for Class A vehicles only. An applicant must first title their vehicle and have a regular Class A plate issued on that vehicle. No requests will be accepted unless the Division has a record of that vehicle and current plate. A personalized plate can be transferred to another vehicle in the original registrant’s name or from husband to wife or wife to husband. A $5.00 transfer fee and $.50 insurance fee is required. Buying a used car in West Virginia? Don’t make a costly mistake. Run a Free License Plate Lookup for your West Virginia-registered vehicle! Run a Free West Virginia License Plate Lookup to uncover the full-story of your West Virginia-registered vehicle.